A Leisurely Thailand tour that combine the easy style of Thailand and its historical sights, cultural activities, religious temples and monasteries, beach resorts and more. 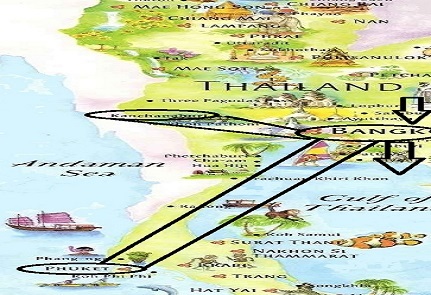 Visit exciting Bangkok, historical Kanchanaburi and relaxing Phuket. Welcome aboard your flight to Bangkok. Enjoy the gracious hosts aboard the wide body jet. Indulge yourself with delicious meals and choice of wines and champagnes and service, "smooth as silk". Arrive in Bangkok, arrival reception and transfer to Hotel Siam City/Asia Bangkok. Day at leisure to rest and relax. After breakfast at hotel. A drive outside the city to the rural Floating Market at Damnoen Saduak where fresh fruit and produce and all varieties of household Goods are sold at bargains, from small boats and floating platforms. This evening free. (B) This evening free. Today is at leisure for bargain shopping of gems and silks that Bangkok is famous for, or we suggest a day trip to Pattaya. This morning we leave for Kanchanburi via Nakorn Pathom, Visit the Allied war cemetery, Jeath Museum and the famous River Kwai Bridge. Check into Pung Waan Resort. After lunch, we have free time for optional activities. After breakfast, we'll board the Death Railway train, which was constructed by the allied prisoners of war during WW II. Transfer to airport for flight to Phuket. Transfer to Hotel Phuket Resort. Begin your day with wonderful tour of this seaside province. You will see the panoramic views from vintage points, Great fishing villages’ setup by the first settlers of this province. Free day. Beach, sun and sand. Late afternoon fly back to Bangkok for overnight. Transfer to airport for homeward bound flight, with onwards connections available to most US cities.